In underpinning. 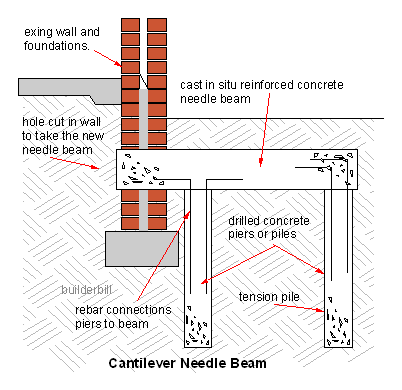 A cast in-situ concrete beam, usually sat on piles or concrete piers that passes through and supports a wall, or foundation from one side of the wall only. In foundations work. A pile that works in tension. For example one at the tail end of a cantilever beam. Note! The above sketch is an indication only and the piers would be deeper and the rebar is a brief indication only. This type of beam has the advantage of being a lot less invasive to the property than the standard needle beam. The underpinning work can be done entirely from the outside of the property.